The top 10 passers in the Civil Service Exam Subprofessional level for August 2018 are available at this website as Civil Service Commission (CSC) releases the full list 60 days after the administration of exams. The CSC recognizes the top 10 examinees who garnered the highest examination ratings both for professional and subprofessional levels. Shown below is the complete list of August 2018 CSE-PPT top 10 examinees - Subprof including the Region they're from as well as their rating. The list is courtesy of CSC. As mentioned in the main page of this article, official results will be published within 41-60 days after the exams or by second week of September 2018 to second week of October 2018. PRCboard.com is one of the trusted websites that provides timely and reliable information in any board examination conducted by PRC and other related government agencies. 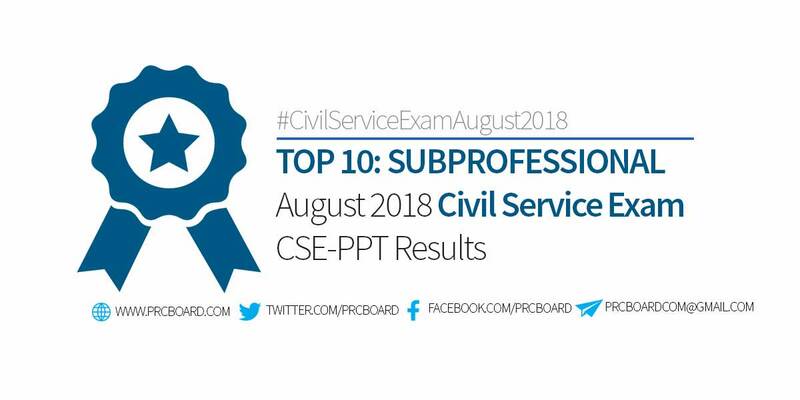 To keep updated on the official result of August 2018 Civil Service Exam CSE-PPT, we advise our visitors to bookmark this page, visit CSC official website, follow us at our social media pages via Facebook and Twitter or join the members discussions at our Facebook Group.